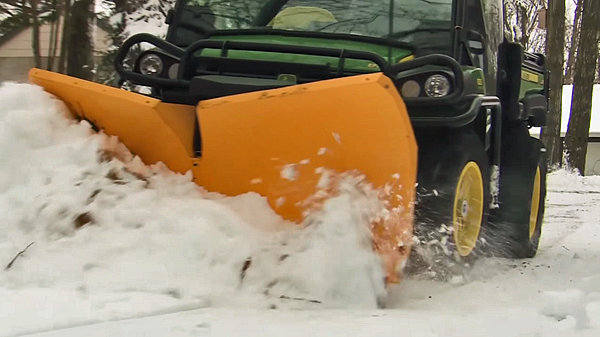 UTV and ATV Plows - Guide Covers Both Snow and Dirt Plows. There are two main types of ATV plows. Snow and Dirt. This guide will explain the differences and show you the most popular of each type. Be aware that adding any plow system, front or rear, could require heavier springs at that end of the ATV, and a ballast weight at the opposite end. UTVs may be better for larger plows due to their heavier weight, larger size, and ability to add more ballast. Straight - a straight blade mounted at the front of the ATV, usually to a frame that is attached to the bottom of the ATV chassis to provide support for the snow plow. Angle - Straight blade with the ability to adjust angle. Less expensive plows set the angle manually with a pin and series of holes. More expensive models may use the winch cable and pulleys or hydraulic rams to set the angle while in motion. Side Wing - side extensions for the snow blade. "Wings" or extensions attached to the ends of the blade to give more of a scoop action. Straight blade ATV snow plow set at an angle. 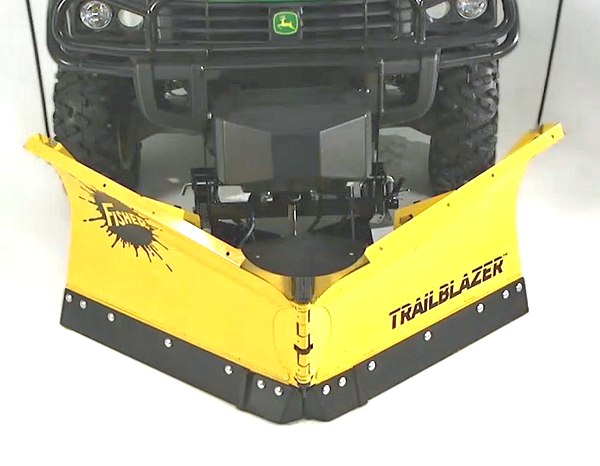 V blade - ATV V-blade snow plows have a hinge mechanism in the center that allows for multiple configurations and positions of the blade. They can be used as a straight blade or angled to either side. Either side of the blade can be set independently of the other. The blades can be swept back in the V shape or angled forward to form a scoop shape. V-blades are the most efficient, being able to move as much as 30% more snow than regular straight blades. V-blade in an angled straight blade configuration. V-blade in the V position. Can be reversed to form a scoop shape. Moldboard - Used to establish garden plot in new soil. 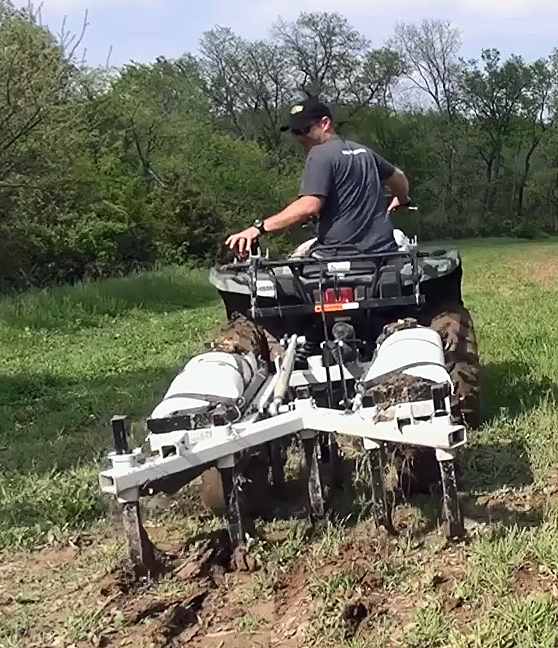 can also be used to dig shallow trenches up to 8 inches. They normally are attached with a sleeve hitch. Moldboard refers to the curvature of the plow blade. Bottom plow - Sometimes called a moldboard plow. designed to cut underneath grassroots and cut to a deeper depth. Double bottom moldboard plow with disc blades. Chisel - Has a combination of plowing tines and may also use disc blades. 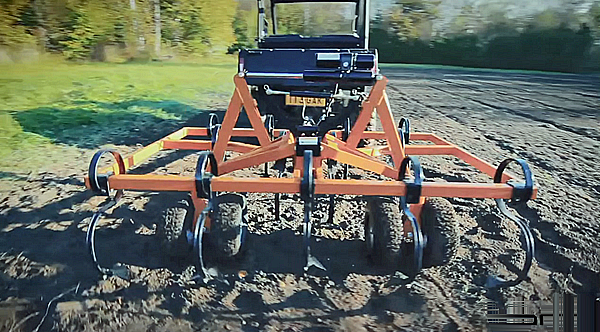 similar to a cultivator but can turn and chop soil at the same time. 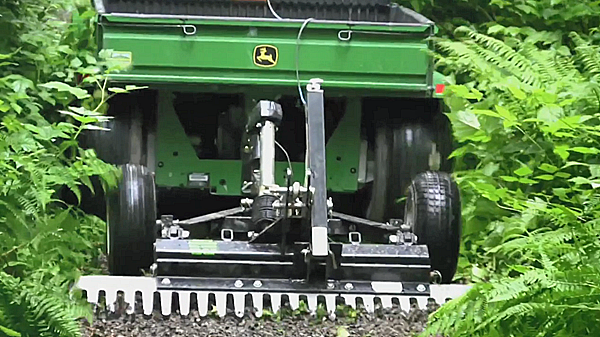 Cutting blades tend to be heavier duty than those on a cultivator. Disc plow - multiple disc blades mounted in a frame. can have single or multiple rows of blades. 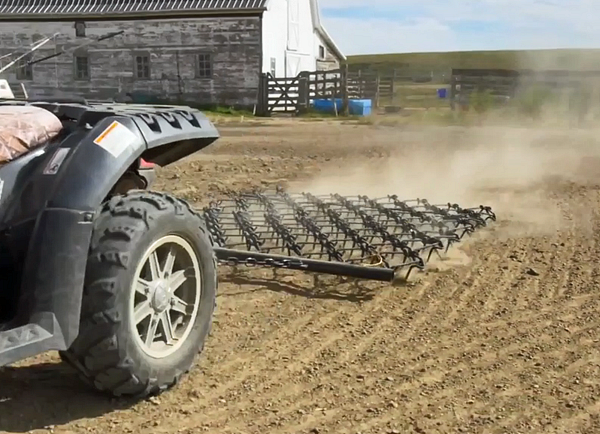 Disc harrow - Uses angled disc blades for more complete soil tilling. Many models have wheels and tires that can be lowered so the plow can be transported between work locations. 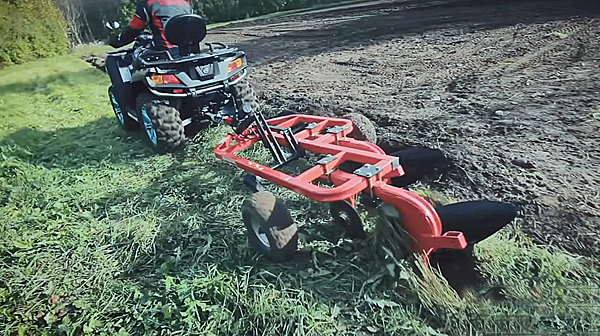 Chain Harrow - Used for light harrowing at a shallow depth to smooth dirt. Made of light duty cutting tines linked or chained together. Rake - or combo plow rake. Has a rake style blade that can usually be positioned at different angles for raking and smoothing dirt. Plow rakes have some sort of cutting blade installed in front of the rake blade. Allows for breaking up soil and smoothing in one pass. Combination plow loader - A front blade and bucket combination capable of carrying material in the bucket. Because of the extra weight on the front, your ATV could require heavier Springs and ballast weight in the rear. Bucket plow front end loader. Blade - Landscape or grading blade. Can be mounted either front or rear. Cultivator - Has multiple Plowing tines. normally used to break up existing garden plots or for de-weeding. Turns soil at a shallow level over a fairly broad space. Normally uses a sleeve hitch. Single point or sleeve hitch - Normally used by moldboard plows, cultivators, and disc Harrows. Manual or electric lift. 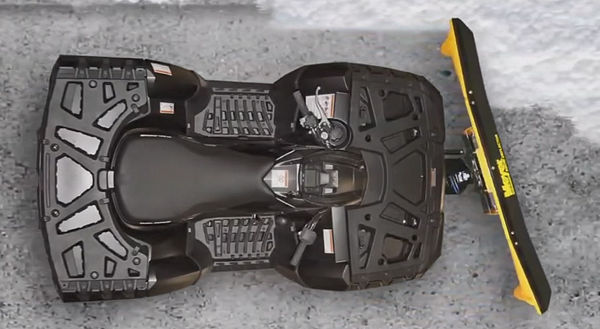 Electric lifts can produce up to 500 pounds of downforce on the plow. Most plows designed to be used with garden tractors or small tractors will have sleeve hitches. Similar to hitch pin but normally has a wider bracket. 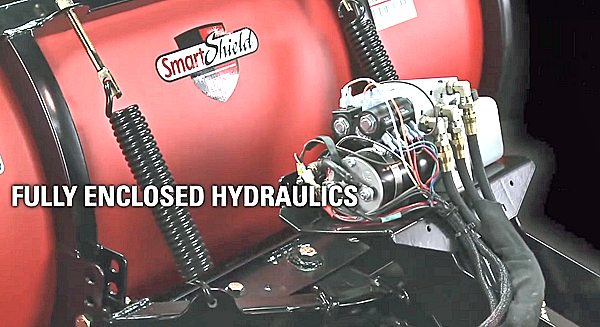 Most common sleeve hitch types with electric actuator or manual screw lifts. 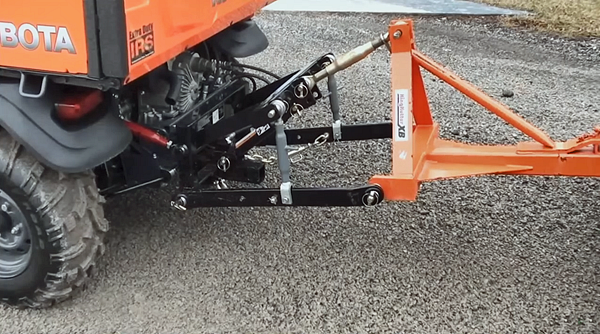 Three point hitch - Eliminates the need for a pull-behind drawbar. Allows the entire plow to be lifted for easier transport. Makes heavier plows easier to handle. 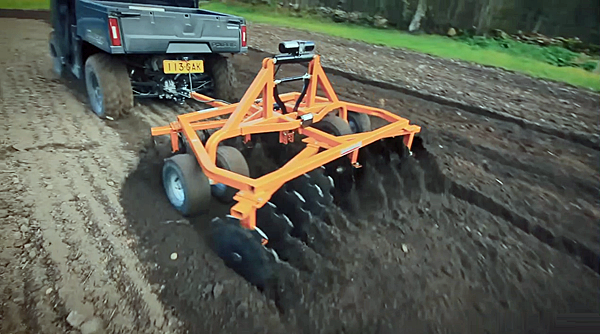 Allows the use of plows designed for small tractors to be used on ATVs. 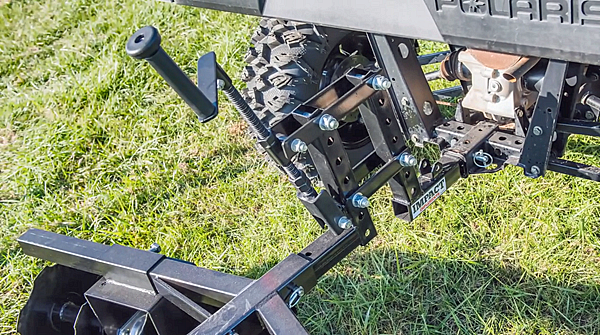 Ball hitch - Most plows designed specifically for ATVs will come with a ball hitch. These plows have a conventional drawbar similar to most pull behind trailers. Advantages are lower cost and great convenience. Disadvantages are the extra length and inability to apply downforce from the towing UTV or ATV. Ballast can be added directly to most ATV plows. Receiver - The square tube receiver come standard on most UTV's and many of the larger ATVs. 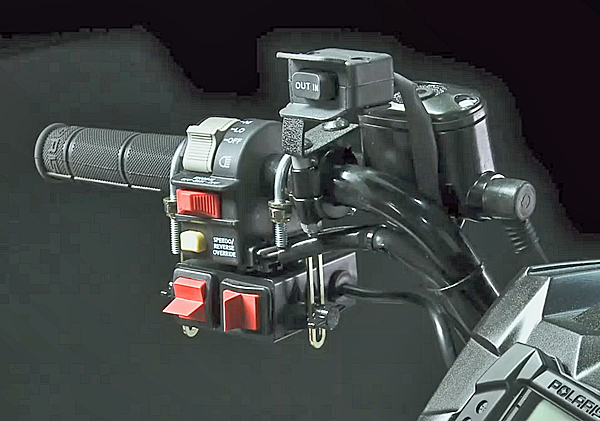 there are sleeve hitch adapters made to plug directly into the receiver. 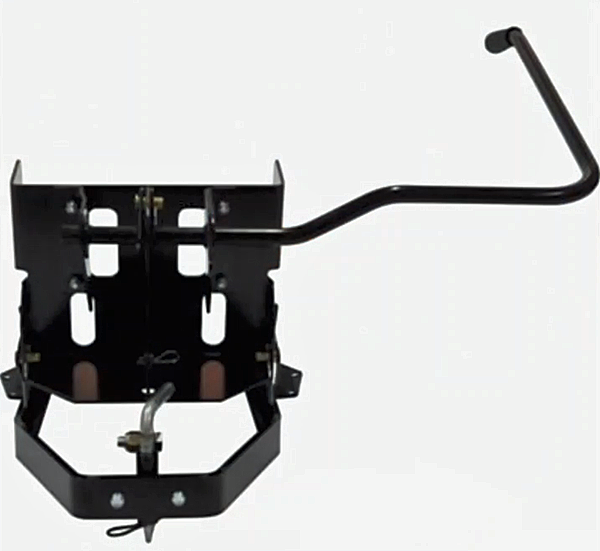 Sleeve hitch with a receiver connector for UTV and ATV plows and manual screwjack lift. Manual - Lift bar or tube that allows the plow to be leveraged up manually. Mostly used with lighter weight plows. 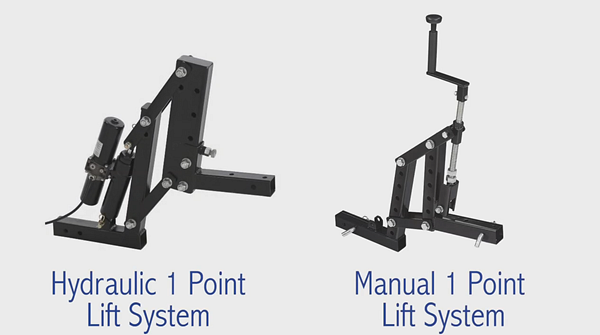 Manual lift bar sleeve hitch. Winch - Uses an electric winch and cable to lift the plow. 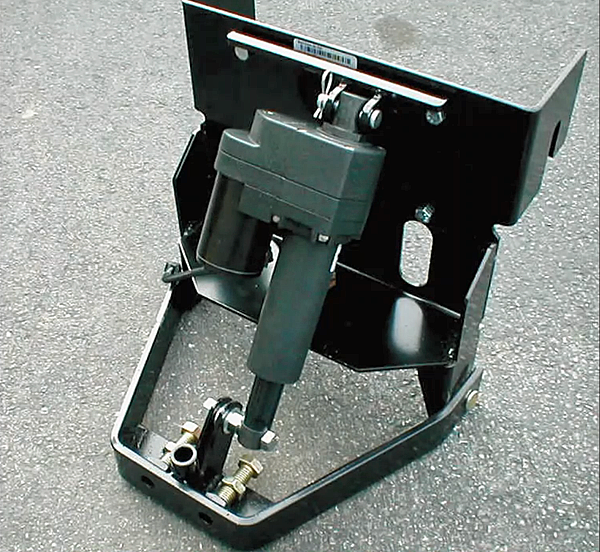 Can be mounted to a sleeve hitch adapter or three point hitch. Winch lift for a snow plow. Electric - An electric screw jack or linear actuator is seen on several sleeve hitches as a way to provide downforce to the plow, as well as lift. Sleeve hitch with linear actuator. Hydraulic - Uses electrically controlled hydraulic rams to lift and lower the plow and set the angle of the blade. Eliminates the need for winches, pulleys or manual lift bars. 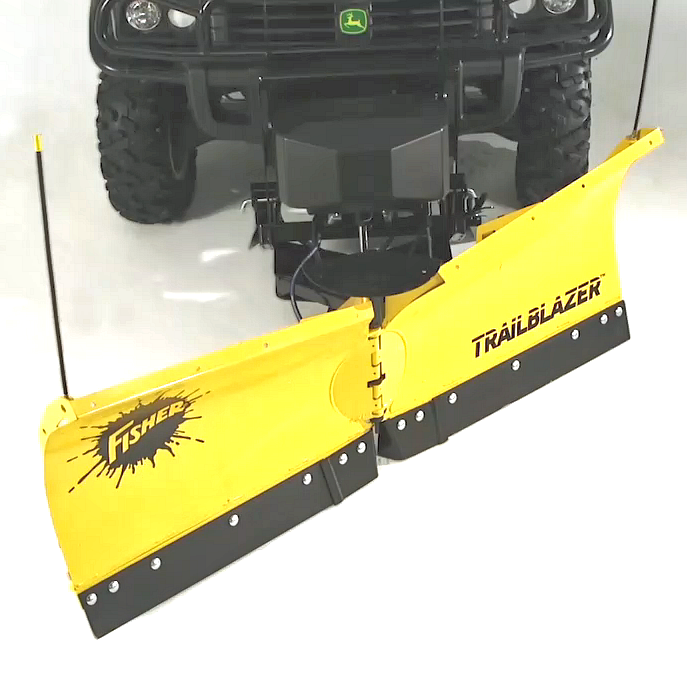 Capable of producing downforce like the single point, along with lift for UTV or ATV plows. Most have controls that can be operated from the driver's seat for added convenience. 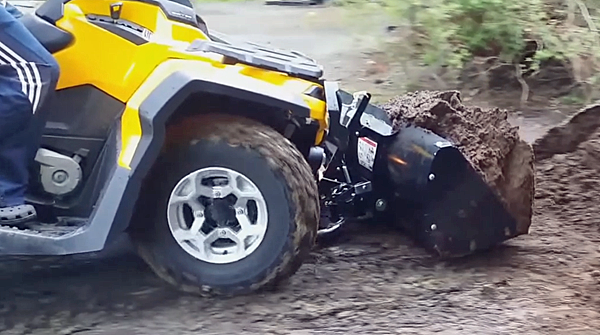 ATV Disc - Buying tips for one of the most popular ATV implements. 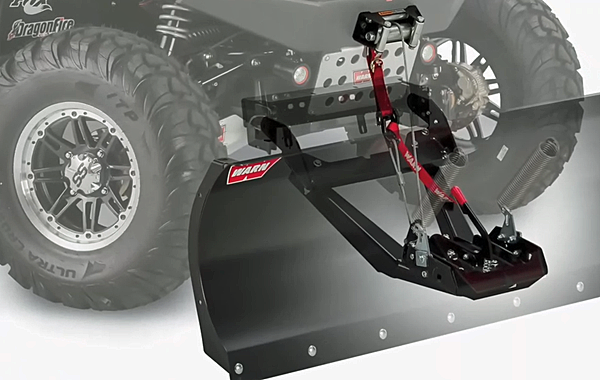 Home › ATV Accessories Guide › Guide to UTV and ATV Plows.